Note that the word "Abruzzi" is an ancient name (referred to an ancient division of the region into three subdivisions: Abruzzo Citeriore, Abruzzo Ulteriore I and Abruzzo Ulteriore II) and no longer used. The actual and official name of my region is Abruzzo. Abruzzi adopted a flag on the 21 may 1999, (regional law nr. 29). The flag has a bright bordeaux ground and a gold border, and the coat of arms of the region in the middle. The name of the region doesn't appear on the flag. On the hoist there is a ribbon in the Italian colours.The flag shall be diplayed with the Italian and European flags on all official buildings of the region, provinces, communes, etc... At night if displayed, the flag shall be illuminated. Source: press release about the adoption of the flag of Abruzzi. I suspect that this can be a wrong interpretatation. The law say: "La bandiera della Regione Abruzzo è costituita da un drappo di forma rettangolare con al centro lo stemma della Regione, nei colori e nella forma individuati dalla L.R. 22.7.1986, n. 26, posto sul fondo di colore bordeaux brillante contornato da una bordatura in colore oro; lo stemma ha dimensioni pari a tre quinti dell'altezza della bandiera medesima." Translated: "The flag of the region of Abruzzi is formed by a rectangular cloth with the arms of the region in the center, in the colors and in the form stablished in LR 22.7.86 n. 26, push in background of light bordeaux color and sourronded by golden border. The arms have as size 3/5 of the hight of the flag." If I understand correctly, and, as also Roberto Breschi, Mario Dalcieri and Masimo Bonini among others think that sourronded by gold border is not the flag but the arms. Or perhaps Pascal interpreted correctly. As I currently have the issues of Vexilla Italica, here are some comments on the flag and the gonfalone of the "Regione Abruzzo". The respective laws can be found at <leggi.regione.abruzzo.it/leggireg/1986/l026.htm> (Coat of Arms and gonfalone) and <leggi.regione.abruzzo.it/leggireg/1999/l029.html> (flag). The Gonfalone is described as (Art.2) (my translation): "The gonfalone of the region reproduces, in the center, the arms according to the preceding Art. 1, surmounted by the inscription "Regione Abruzzo", as in the enclosed sketch "B" that forms an integral part of the present law. The field is of brilliant-bordeaux colour, surrounded by a border. The base is fringed at the peak, whereas at the upper part there are the sleeves for the insertion of a staff of glossy brass supporting the gonfalone. The border, the fringe and the sleeves are of golden colours." how wide the golden border in the gonfalone actually is. [zig86c] had mentioned that there were no symbols of the region at the time. [zig87d] first described and showed the CoA, as well as describing, but not showing the gonfalone; this article also mentioned the unclear and misleading language of the law, especially the border mentioned in the part about the Coat of Arms (the border actually not delimiting the stripes, but the whole shield) and the colour "bordeaux". In [dLc93a] there is a b/w sketch of the gonfalone (basically as we have it below). The golden border seems to be slightly wider than in Mello Luchtenberg's image of the gonfalone (4 instead of 2 pixels), but I wouldn't bet on that. The colour of the sleeves and the fringe should be golden as well (see the law); as the colour image of the flag in [vxi00c] shows a somewhat brownish, darker red, I would say, the gonfalone should also show this colour (about RGB 204-0-51). The flag is described in the 1999 law (Art. 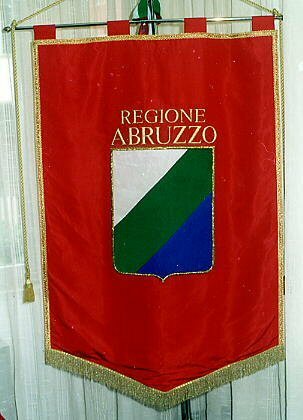 1) (my translation): "The flag of the Region Abruzzi consists of a cloth of rectangular format, with the arms of the region, in the colours and the form identified by the L.R. 22.7.1986, n. 26, in the center, on a field of brilliant-bordeaux colour surrounded by a border of golden colour; the arms has a size of 3/5 of the height of the flag itself. The flag has a height of 2/3 of its length." [zig96b] showed a flag in the pattern of the gonfalone (i.e. with inscription), but this was corrected in [vxi00c]: the image in this article shows a brownish red field with the Coat of Arms (bordered golden) in the center (no inscription), and a golden fringe (no golden border!). Having read the law about the flag as well as the law about the gonfalone, I would say, that the CoA and the flag should have a golden border, as interpreted by Pascal Vagnat. If the golden fringe in the image in [vxi00c] is an interpretation of this "golden border", I don't know. This is another case of misleading law text; we definitely would need a foto of an actual flag. Literature: laws mentioned above, articles in Vexilla Italica,[zig86c], [zig87d], [dLc93a],[zig96b] and [vxi00c]. The gonfalone and the arms were adopted on the 22nd July 1986. The coat of arms is tierced per bend sinister argent, vert and azure. The shield is of sannitic shape. The colors stands for the snow, the woods and hills and the sea of Abruzzi. The gonfalone is red with the coat of arms in the middle and the words Regione Abruzzo in gold above. See also a photo of the gonfalone from <www.regione.abruzzo.it>. The shield is fimbriated in gold.